Aviation workers have issued a strike notice in opposition to planned takeover of the Jomo Kenyatta International Airport (JKIA) by Kenya Airways. The Kenya Aviation Workers Union (Kawu) says its members will go on strike in the next one week, claiming taking over the country's main airport will render them jobless. The looming industrial action, Kawu says, will include ground staff at JKIA who are expected to boycott duties starting next Tuesday. Workers at duty-free shops, inflight functions and cargo operations will also be expected to boycott work. "We are issuing a seven-day strike notice to all stakeholders from date herein and we are saying that if [CEO Jonny] Andersen will not be out of KAA in the next seven days, we will ground operations at JKIA," Kawu secretary-general Moses Ndiema said in a letter dated January 29 to its members, KAA management, Labour Cabinet Secretary Ukur Yatani and Cotu secretary-general Francis Atwoli. "There is no need to kill KAA to save Kenya Airways, which is simply suffering from management problems," the letter adds. Neither the national carrier nor KAA responded to Business Daily's queries on the matter by the time of going to press. KQ's plan, contained in its Privately Initiated Investment Proposal (PIIP), includes the creation a special purpose vehicle (SPV) -- a unit of a company which is shielded from the parent firm's financial risk -- to operate, maintain and develop JKIA. 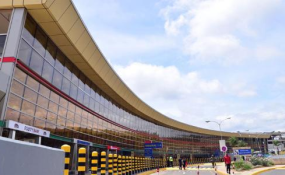 Should KAA grant KQ permission, the national carrier will merge with the State-owned authority as part of a grand plan to turn around its business and cement Nairobi's status as a regional transport hub. Kawu was in the headlines in October following the union's move to issue a strike threat ahead of Kenya Airways' maiden direct flight to US.